Dexter will tell you he has hit rock bottom a few times. Addiction is a theme that has woven through his adult life but is certainly not what dictates his identity. He is a father of four, a truck driver with several decades of experience, and is a passionate person of faith. He has been coming down to the Volunteers of America Mission in good times and bad for years. After an overnight shift driving in the mountains, Dexter can make it to the Volunteers of America Mission in time for lunch. While he enjoys the food and the atmosphere, lately his visits have been about a lot more. "The church service is very inspiring. I feel like I have something to offer," Dexter said. Recently Dexter, along with his partner Michelle, has taken some big steps. Michelle moved to Denver several months ago to be with Dexter. She had no job or place to live and describes her move as a leap of faith. The couple was living in their cars and showering at truck stops. 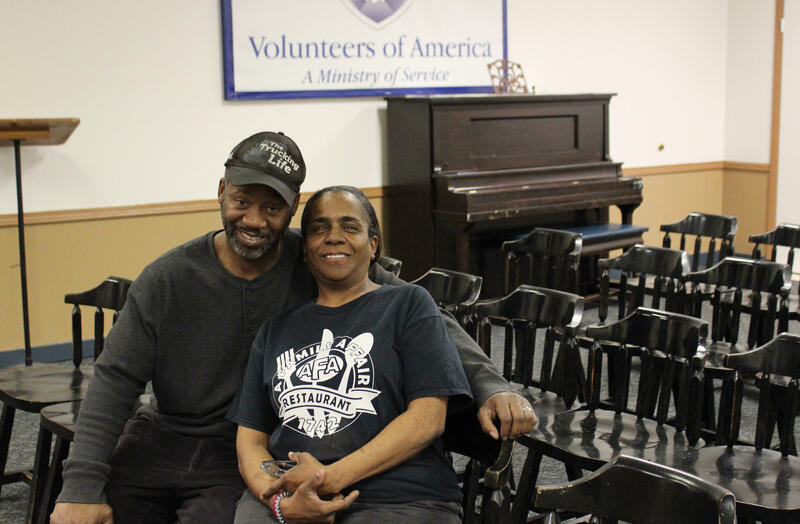 Michelle looked for jobs, Dexter worked the night shift truck driving, and the couple continued to come down to Volunteers of America for meals and worship services. "We were hungry, but it wasn't about eating. It was about getting the word. That put the strength in us to move forward, to apply ourselves," Dexter said. Walking into the Mission, Dexter and Michelle were treated like family with hugs, smiles, and encouragement. While the Mission staff was able to provide clothes and resources, it was the emotional and spiritual support that kept them coming back. The couple worked hard to get into an apartment and Michelle is proud to now have a stable job that she enjoys. When reflecting on their recent trials and accomplishments, they both continued to reiterate how thankful they were to have somewhere to go for support and inspiration along the way. "If anyone out there is truly wanting to change and get themselves together, this is the place," Dexter said. Dexter and Michelle say this is just the beginning. As they move forward, they still keep coming down to the mission for worship. "I love it here, I love it," Michelle said.